Fast growth 60 to 70 feet with equal spread. Its dense, lustrous green foliage turns a deep red in the fall. Grows best in sandy to rich loamy soil in full sun. The fastest growing of all oaks. 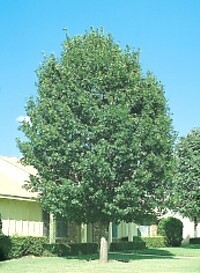 One of the most popular ornamental oaks. It transplants easily, withstands city conditions, is clean in habit and makes one of the best street or avenue trees we have. Red oak is tolerant of urban conditions; i.e., salt, ozone and sulphur dioxide. Native to eastern to mid United States. Very valuable as a timber tree. No shipments to CA,FL,OR.